"F-107" redirects here. For other uses, see F107 (disambiguation). 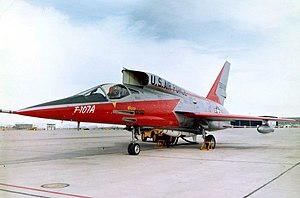 The North American F-107 is North American Aviation's entry in a United States Air Force tactical fighter-bomber design competition of the 1950s. The F-107 was based on the F-100 Super Sabre, but included many innovations and radical design features, notably the over-fuselage air intakes. The competition was eventually won by the Republic F-105 Thunderchief, and most of the F-107 prototypes ended their lives as test aircraft. One is on display at the National Museum of the United States Air Force and a second at Pima Air and Space Museum. In June 1953, North American initiated an in-house study of advanced F-100 designs, leading to proposed interceptor (NAA 211: F-100BI denoting "interceptor") and fighter-bomber (NAA 212: F-100B) variants. Concentrating on the F-100B, the preliminary engineering and design work focused on a tactical fighter-bomber configuration, featuring a recessed weapons bay under the fuselage and provision for six hardpoints underneath the wings. Single-point refuelling capability was provided while a retractable tailskid was installed. An all-moving vertical fin and an automated flight control system were incorporated which permitted the aircraft to roll at supersonic speeds using spoilers. The flight control system was upgraded by the addition of pitch and yaw dampers. The aircraft's most distinguishing feature is its dorsal-mounted variable-area inlet duct (VAID). While the VAID was at the time a system unique to the F-107A, it is now considered to be an early form of variable geometry intake ramp which automatically controlled the amount of air fed to the jet engine. Although the preliminary design of the air intake was originally located in a chin position under the fuselage like the Vought F-8 Crusader, the air intake was eventually mounted in an unconventional position directly above and just behind the cockpit. The VAID system proved to be very efficient and NAA used the design concept on their A-5 Vigilante, XB-70 Valkyrie and XF-108 Rapier designs. The air intake was in the unusual dorsal location as the Air Force had required the carriage of an underbelly semi-conformal nuclear weapon. The intake also severely limited rear visibility. Nonetheless this was not considered very important for a tactical fighter-bomber aircraft at that time, and furthermore it was assumed that air combat would be via guided missile exchanges outside visual range. It was joined by the second F-107A (55-5119), which made its first flight on 28 November 1956. It was used for weapons testing with both conventional and atomic bombs. The last prototype, (55-5120) had its maiden flight on 10 December 1956. At the conclusion of the F-107A's successful test program, the Tactical Air Command decided to hold a fly-off competition between the F-107A and the Republic F-105 which was designed to same mission requirements and used the same engine. Although the competition was close, the F-105 was selected as the new standard TAC tactical fighter. The three F-107A prototypes were relegated to test flying and the pre-production order was cancelled. Prototype #2 (55-5119) was not used by NACA and flown on 25 November 1957 to the National Museum of the United States Air Force at Wright-Patterson Air Force Base near Dayton, Ohio. 55-5118 – Pima Air and Space Museum, adjacent to Davis-Monthan AFB in Tucson, Arizona. 55-5119 –On display in the experimental aircraft hangar at the National Museum of the United States Air Force at Wright-Patterson AFB near Dayton, Ohio. ^ a b c Baugher, Joe. "North American F-100B/F-107." USAF Fighters, 27 November 1999. Retrieved: 10 July 2011. ^ a b "NORTH AMERICAN F-107A" National Museum of the USAF. Retrieved: 16 July 2017. ^ "YF-107A Ultra Sabre/55-5118." Pima Air and Space Museum. Retrieved: 10 May 2013. Wikimedia Commons has media related to North American F-107. This page was last edited on 26 March 2019, at 20:59 (UTC).